We’ve looked at attempts to improve conventional SRAM. We’ve looked at completely different memory technologies that might be in line to replace SRAM, like RRAM (first more than five years ago, then last year – and we’re still working on it) and MRAM. And, a couple of years ago, we looked at one attempt to create a new SRAM technology out of conventional transistors – to be clear, just one such transistor (instead of six), plus a possible select transistor. The company was Zeno, and they were even leveraging this idea as a way to provide greater drive in a transistor – possibly meaning one could stick with older technologies for longer. But, back in the memory story, there was at least one unknown – granted, a “we think so,” but without proof. Here’s the thing: the original technology was proven on 28-nm planar technology. Could it be leveraged onto more aggressive nodes – ones with FinFETs? While Zeno thought it should work, they hadn’t run the experiments yet to prove it. At this year’s IEDM, they came back and reported on those two items – both in a discussion and in a paper that they presented. And the answer to the two questions is: Yes. The next figure shows the layout at 14 nm, with a 6T conventional SRAM on the left and their 1T version on the right. They also showed the “profile” at 14 nm as compared to the original 28-nm planar version. Note both the use of a FinFET and the absence of the underlying n-well on the right. This latest rendition uses the standard foundry CMOS process. 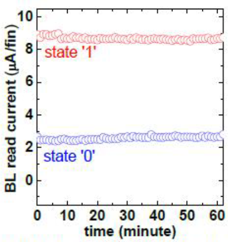 They presented data showing the stability of the bistable element as data is read repeatedly, showing it sticks around – and that the read operation isn’t destructive.